Zero Waste Scotland (ZWS) is a government funded organisation working towards a great cause: to reduce Scotland’s waste and increase sustainability across the country. The team were looking to create personas for new consumer facing digital channels. The channels are to be lifestyle focused, encouraging people to refuse, reduce, re-use and recycle. The personas are key to helping the team develop an effective content strategy and produce content that meets the needs of target users. Budget constraints meant we could not conduct these interviews with users so we spoke to the next best thing: customer-facing staff members. The project began with a 2-day trip to bonny Scotland, to meet project lead, Amy Weir, and conduct 9 interviews with customer facing staff members. Our job was to extract as much information as possible from the staff about their users: what sort of people are they, what information do they need, what barriers do they face, what stops them getting involved in sustainable behaviours and so on. On our return to Web Usability HQ we got down to some serious desk research, reviewing social media and website analytics from existing ZWS sites to identify popular content. We also took an academic approach to these personas and disappeared down a Google Scholar wormhole of behavioural theory. In particular we spent time looking into the theory of behaviour change and what motivates certain sustainability behaviour (recommended reading for everyone!). With the interview outcomes and desk research in hand, we began by creating a list of user types and matching them to user goals, surfaced during the discovery phase. When mapped together, this demonstrated that the majority of users had similar digital goals and splitting our personas this way provided little useful distinction. What did divide our different user types were their motivations. This became the foundation for the personas. Before finalising the personas, we nipped back to Scotland to present our findings to Amy and the team. This was a chance to align ZWS’s strategic priorities with the personas to ensure they are as effective as possible. The finalised personas were refined to 3 primaries and 2 secondaries. Following discussion with ZWS stakeholders it became clear that motivating behavioural change in the primary personas would have the biggest impact towards their mission of living in a zero waste economy. The secondary personas are there to act as a reminder of the other user types ZWS content may reach as they are an important group for advocating change in less-engaged people. 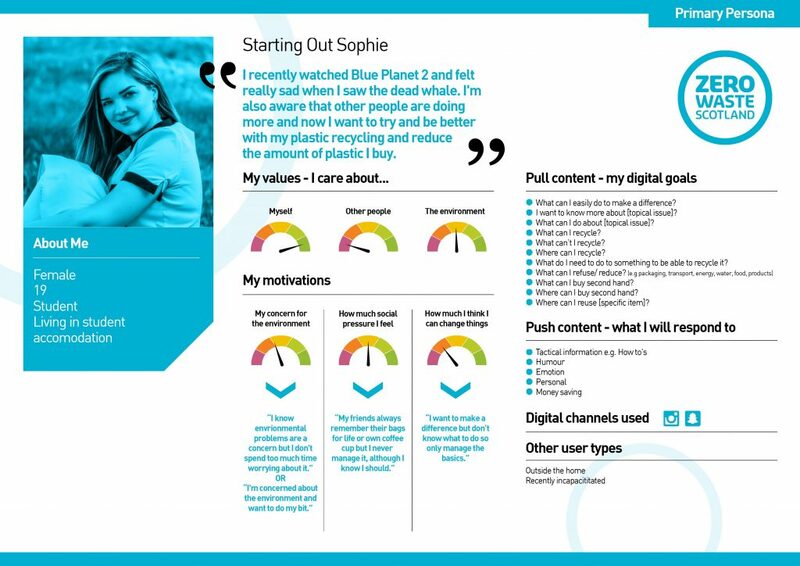 The personas are now being used by the content team as they work towards the launch of their consumer facing channels.